Here’s an idea that might just stick: a smart label that helps prolong the shelf life of certain fruits and vegetables. Created in Malaysia by Zhafri Zainudin, ‘StixFresh’ stickers are coated with a mixture of sodium chloride and beeswax, which slows the fruit ripening process by removing ethylene. The sticker uses 100 per cent natural ingredients to keep the fruit looking and tasting farm fresh for up to 14 days or longer — and you can even eat the label. According to calculations done in the United States, 52 per cent of fresh fruit and vegetables don’t even make it to the consumer, but instead go to waste during transport to supermarkets, causing an annual loss to industry in the tens of billions of dollars. Zainudi, the founder of Stixfresh, said it took him almost three years to perfect the manufacturing process and efficacy of the sticker. “We did a joint development with our local university Universiti Putra Malaysia (UMP), research institutions and agencies such as Mardi and Standard and Industrial Research Institute of Malaysia (SIRIM), and recently with Bogor University and University of South Australia,” Zainudi said. 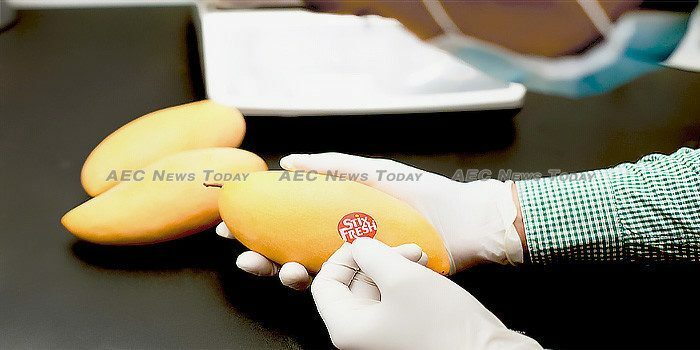 At first, the stickers were only targeted at extending the shelf life of mangoes. However, the company later found out that the stickers worked on other types of fruit that shared almost the same size, along with other similarities such as skin texture, susceptibility to disease and fungal attack. The sticker is now used on other fruits including avocadoes, papaya, dragon fruit, star fruit, apples, and pears. The StixFresh company has so far spent RM1.8 million (about US$430,000) on production machinery and equipment, research and development, intellectual property through the Patent Cooperation Treaty, Food and Drug Administration, along with exhibition and promotional costs. Currently, StixFresh is operating in two locations, initially starting in Senawang, Negeri Sembilan, Malaysia, before launching in Kirkland, Washington, United States, this November. Since 2017, StixFresh has sold more than 1.3 million stickers to Harumanis mango growers in Perlis, Jabatan Pertanian Negeri Sembilan, Aeon Big, and other imported-exported fruit companies.